Nissan expects the latest iteration Rogue to become their top-selling vehicle. The 2017 Nissan Rogue 5-passenger crossover comes with a host of enhancements, delivering advanced safety, security, connectivity, infotainment and driving aid technologies. 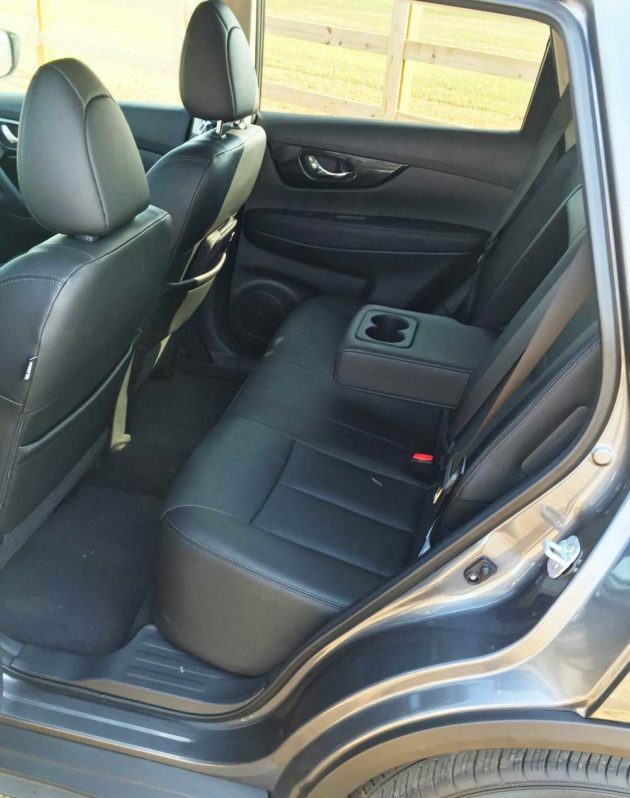 2016 model Rogues featured a carryover 2nd generation design and a manually operated power tailgate, no interior changes and there was only one powertrain available – a 2.5-liter inline four-cylinder gas engine rated at 170 horsepower and 175 pound feet of torque. While the term rogue generally applies to an unprincipled, deceitful, and unreliable person; a scoundrel or rascal, or something large, destructive, and anomalous or unpredictable. Rogue can also be a reference to operating outside normal or desirable controls. The 2017 Nissan Rogue is perhaps the exact opposite of all of the above. It is not large, destructive or unpredictable and it exhibits an elevated level of control. It exhibits “Biokenetic Synchronicity”, which is the harmonious blend of exterior visual clarity, dynamic strength and smart premium in one design package, while the interior showcases protected comfort, smart premium and meaningful efficiency. 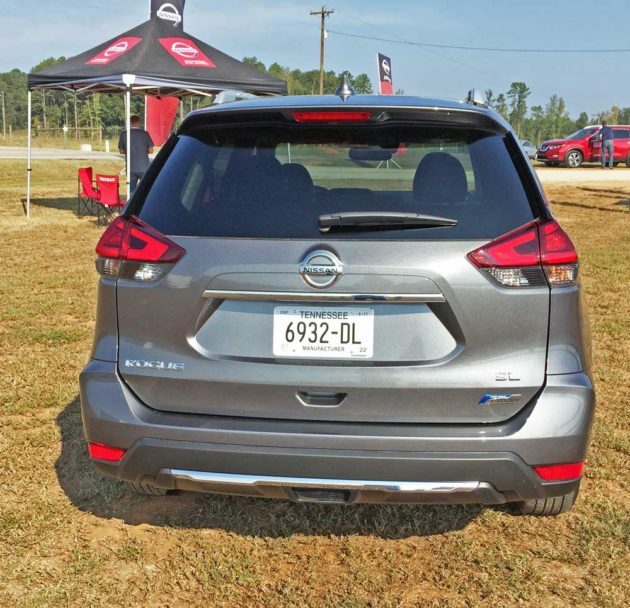 Exterior enhancements that are new for the 2017 model year include: New front and rear fascias, Nissan’s signature V-motion grille, integrated fog lights, revised rear combination lights with LED boomerang signature taillights, chrome side moldings, a Motion-Activated Liftgate, new 17-inch, 18-inch and 19-inch wheel designs, the addition of three new exterior finishes and body improvements focused on minimizing road, wind and mechanical NVH. Interior feature upgrades for 2017 include: a redesigned front center console, new trim finishers, new cloth seat materials, a new D-shaped steering wheel, an available heated steering wheel, a new sport mode shifter with a leather boot, available memory seats and mirrors, heated cloth seats and remote engine start standard on SV grade. 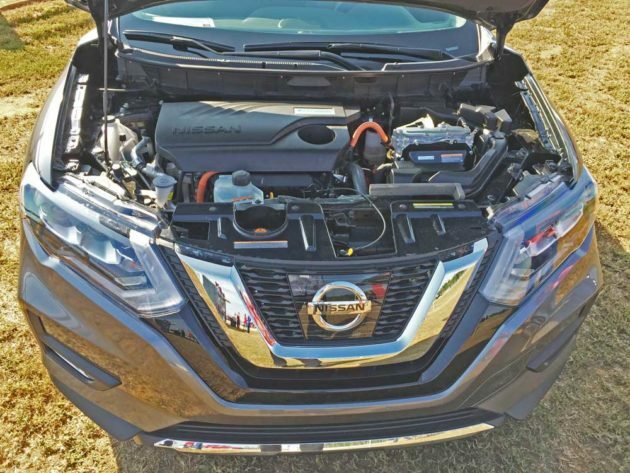 In the power department, a new gasoline-electric hybrid powertrain has been added to lineup – a 2.0-liter inline 4-cylinder combined with a 30 kW electric motor and Nissan’s Intelligent Dual Clutch system that delivers 176 net system horsepower along with a regenerative braking system. This is the first ever Rogue Hybrid, while the 170-horsepower 2.5-liter 4-cylinder gasoline engine remains as the Rogue’s energy source. Both engines mate to an Xtronic transmission with manual gearshifts and Sport and Eco Mode switches. Vehicle safety, security and convenience benefit from the addition of: Intelligent Cruise Control, Forward Emergency Braking with Pedestrian Detection, Lane Departure Warning and Lane Departure Prevention, Blind Spot Warning and Rear Cross Traffic Alert has been added as standard to SV grade and High-beam assist headlights now come on SL models. Option Packages have also been added: a new Sun and Sound Touring Package, a new Platinum Package and a new Platinum Reserve Interior. 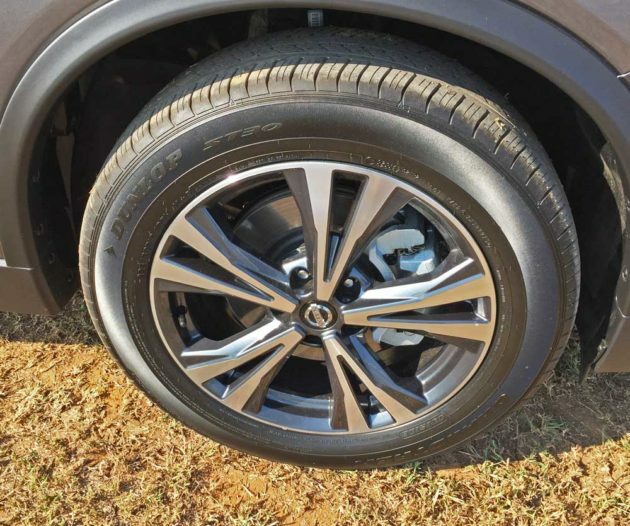 Three trim levels are offered for the 2017 Nissan Rogue – S, SV and SL, each with a choice of front-wheel or all-wheel drive. The new Rogue Hybrid is only offered in two grade levels – SV and SL, in FWD with AWD available at a later date. Rogue Hybrid SV and SL models feature several differences from their non-hybrid stablemates. 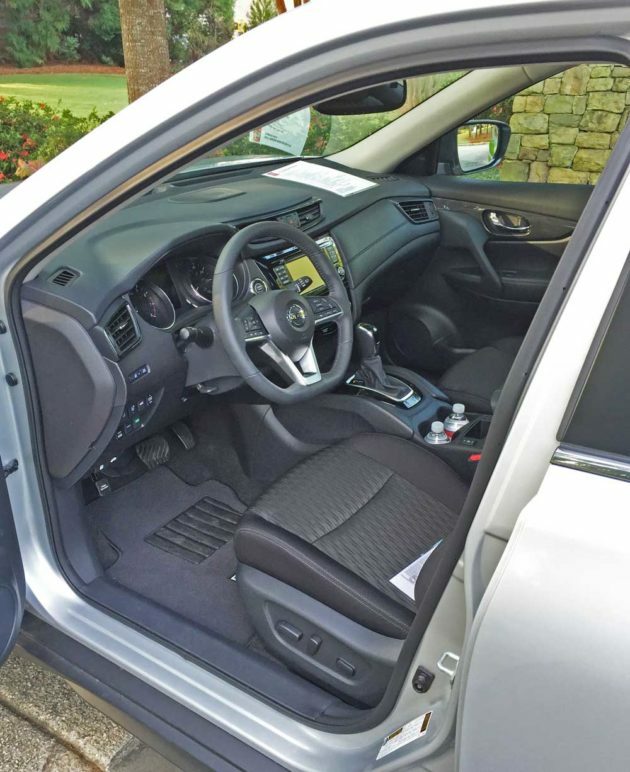 An HEV gauge is added to the Advanced Drive Assist Display, the 2nd row seat is a 60/40 split folding design, a storage space is added under the rear cargo area and Pure Drive HEV exterior badging is added. Other additions include an HEV badge on the engine cover and the dual horn includes a Vehicle Sound Generator when driving in the electric mode. Pricing begins at $23,820 for the Nissan Rogue in S trim and front-wheel drive confiuguration. Pricing has yet to be announced for the 2017 Nissan Rogue Hybrid. Since size is an important consideration for many consumers, to put the Rogue’s size into perspective – remember Goldilocks and the three bears? Papa Bear, would be Nissan’s full size SUV, the Armada. 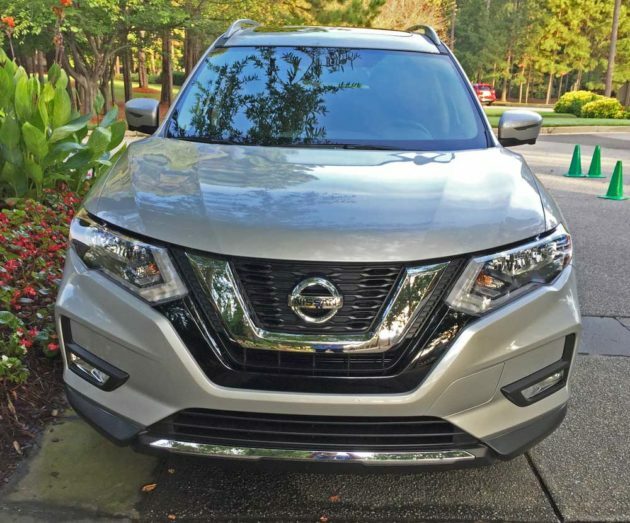 Mama Bear would be likened to the popular Murano, and the Rogue, which was Nissan’s first entry into the small crossover segment in 2008 would of course fill the role of Baby Bear. 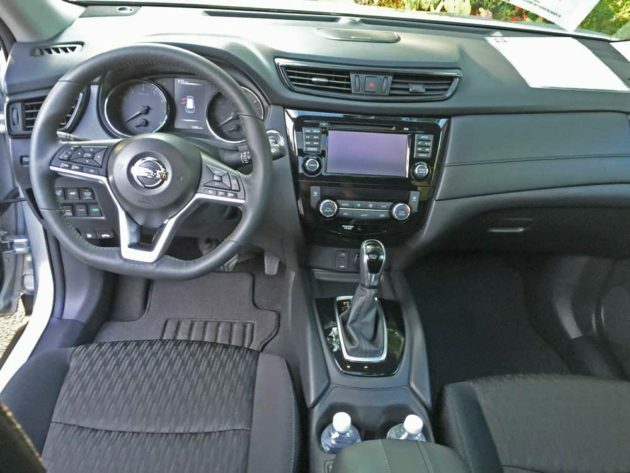 The Nissan Rogue is designed to satisfy both emotional and functional needs and will compete with the likes of Toyota’s RAV4 and Honda’s CR-V, It provides a fun-to-drive quality in an aggressively styled, performance-oriented package. The 5-passenger Hybrid supplies more functionality and versatility than a sedan, with unique storage capability throughout. Stepping inside, Rogue offers a number of available utility features, including a fold-flat front passenger seat, a second row 40/20/40 split-fold bench seat with EZ Flex® Seating System, an oversize glove box with partition and a versatile, dual-level center console storage. Gauges and switchgear are sporty and well positioned for ideal user-friendliness in the sporty, driver-oriented cockpit. 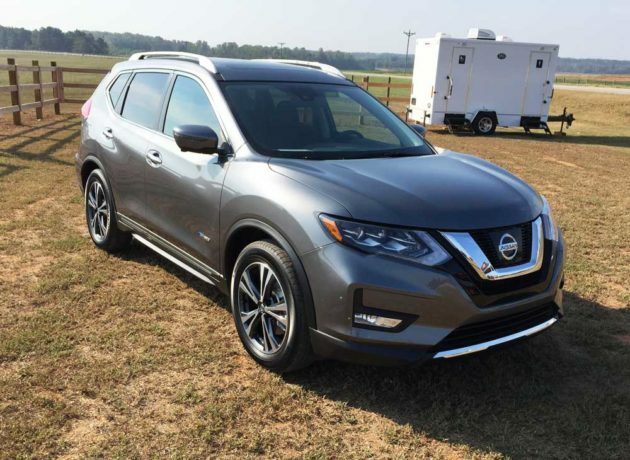 My test 2017 Nissan Rogue Hybrid came in SL trim in a FWD configuration with only a sample equipment Monroney with no pricing other than the Destination Charge of $900. Official Rogue ICE and Hybrid pricing had yet to be announced as of this writing. 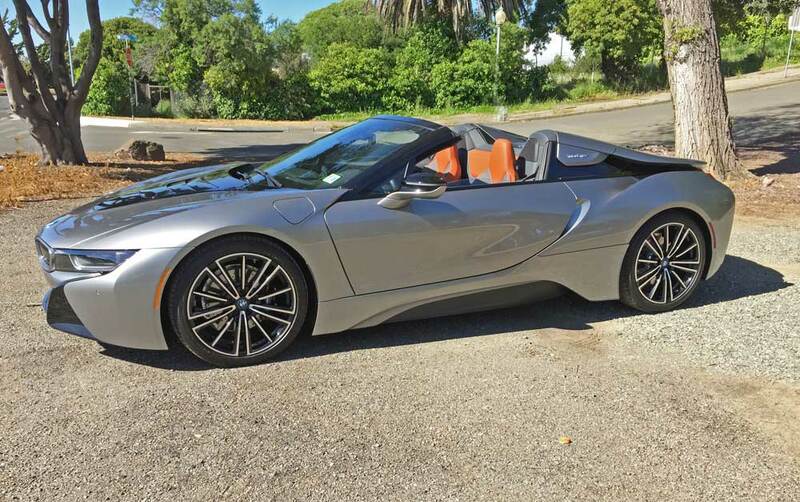 The exterior was sprayed Gun (gray) metallic, while the interior was done in Black with faux carbon fiber trim accents. 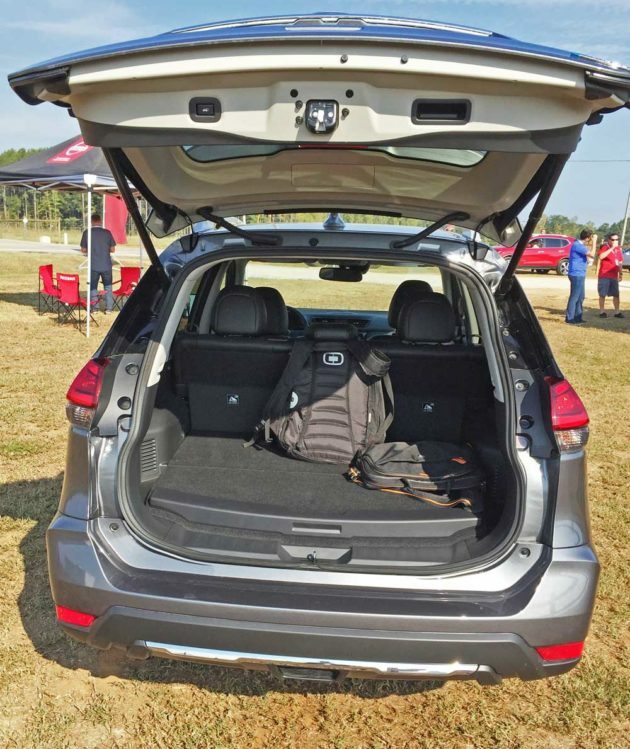 Options included the Panoramic Moonroof and Forward Emergency Braking feature. There are also loads of standard features and amenities. SUMMARY: As in the Goldilocks tale, the Nissan Rogue seems to be “just right”. Its crossover designation places it in a unique category, delivering the agility and nimble handling characteristics of a sporty sedan, while providing the added functionality required by many without being oversized. It is fun to drive, easy to park and economical to operate. The exterior design delivers a satisfying visual appeal with sporty styling in an attractive condensed package, while the interior offers a pleasant place to be, with comfort and a positive ambience. The entire package is affordable and represents an outstanding value. to two inches of seat height adjustability. 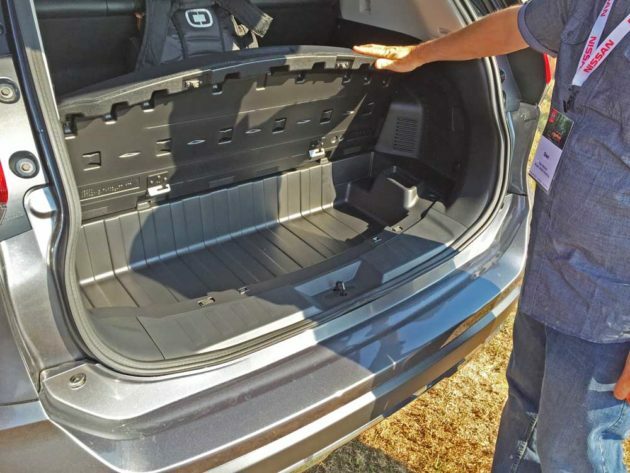 Also available is a washable, removable tray that fits below the cargo area floor to accommodate wet or dirty gear and tools and a rear tonneau cover to keep luggage and other items out of sight. Rogue’s practical utility features also include a variety of cupholders, memo/pen holder, coin holder and cell phone/sunglass holders. NissanConnect™ provides connectivity and infotainment, with the choice of a Display Audio and Navigation system. The Audio version provides a 5-inch color display, while the Navigation version comes with a larger 7-inch touchscreen. Safety issues are not forgotten either in the Rogue – included are: Zone Body Construction; Advanced Air Bag System with dual stage front air bags and occupant classification system for the front passenger seat, and front seat Active Head Restraints. Front seat-mounted side-impact supplemental air bags and roof-mounted curtain supplemental air bags (for front and rear outboard occupant head protection) with rollover detection are also standard. In the final analysis, the 2017 Nissan Rogue Hybrid is much more than a mini-Murano. It fills a viable spot in Nissan’s lineup that is sure to be appreciated by many consumers. This latest Rogue is a shining example of Biokenetic Synchronicity and what it stands for. Engine Type and Size: MR20DD 2.0-liter, DOHC, 16-valve inline four-cylinder with Continuously Variable Timing Control System and Direct Fuel Injection. Electric Motor: Advanced 30kW electric motor with Nissan Intelligent Dual Clutch System – 1 motor/2 clutches. Battery Lithium-ion – with 202 volt nominal voltage and 176 horsepower Hybrid System Net Power. Transmission: Xtronic with manual gearshifts and Sport and Eco Mode switches. Suspension: Front – Independent strut with coil springs and 23 mm stabilizer bar and twin-tube SACHS shocks. Rear – Independent Multi-link with 19.1 mm stabilizer bar bar and twin-tube SACHS shocks. Brakes: Power-assisted Four-wheel vented discs with ABS, EBD, BA, G-Sensor and Regenerative Braking System. Tires: Dunlop ST30 Grandtrek 225/60 R18 all-season mounted on 5-“V”-spoke machine face with painted inners. 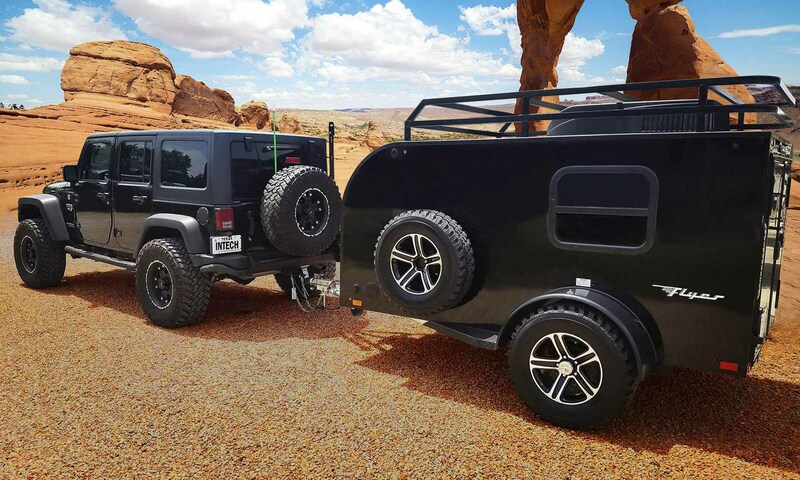 Height: 68.4 inches with roof rack.